We all know that Gibson makes some of the best guitars out there, but when we take a look at the price and realize we can’t afford them, we start looking for alternatives. Gibson has an amazing guitar model called J-200 which looks and performs great, but the price is what keeps people mostly off it. However, as always, Epiphone is there to save the day. The EJ-200SCE is a great alternative to the Gibson J-200. If you’ve read our guide on guitar types, you probably have heard about the Jumbo guitars. 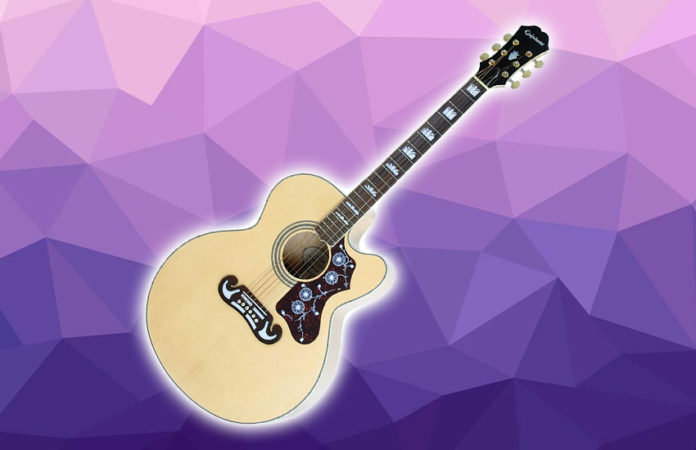 The Epiphone EJ-200SCE is a jumbo guitar which are usually larger than dreadnoughts. Some people say that they are too large and find them uncomfortable. I personally love Jumbo guitars because they look amazing and are capable of delivering a great volume which you can’t get on dreadnoughts. The only downside I see is that this guitar is not suitable for children because of its size. The EJ-200SCE comes with a cutaway. I personally don’t like cutaways too much, but the cutaway on this guitar definitely looks great. The Epiphone EJ-200SCE comes with a Sitka Spruce Top and the Epiphone’s usual Maple Back & sides. The neck is also a maple neck with a rosewood fretboard which makes it easy for you to slide your hands up and down. This makes the playability of this guitar go to a whole new level. Acoustic guitars usually have the standard hardware, but i noticed that this Epiphone model had something unique. I loved the bridge of this guitar because it is made of rosewood – this is something which is popular among high-end guitars. As you already know, most guitars have a bone nut which is the standard for acoustic guitars. The Epiphone used the synthetic bone for this guitar, and apparently, it turned out to be a great substitute for the traditional bone material. One of the things I loved the most about this guitar is that they used Grover tuners instead of the generic Epiphone tuners which are found on most of their low-end guitar range. Since this is a Jumbo guitar, you can imagine how much sound this guitar is capable of making. It has a pretty balanced tone which sounds great both indoors and outdoors. In my opinion, this is one of the best guitars for outdoor playing because of the volume it’s able to deliver. To conclude, I would say that if you want to get something close to the Gibson J-200 without spending a fortune, this guitar would be your best bet. It is capable of delivering large amounts of volume and great sound. Also, let’s not forget that this guitar looks like an amazing vintage guitar that would catch the attention of even people that have never played a guitar before. Since this is a jumbo guitar, i wouldn’t recommend this to children and smaller people, because you won’t be comfortable while playing it. If you want to get a guitar for your children, you should take a look at our top acoustic guitars for children buying guide, where we listed a few guitars models that would be suitable for your children.